Here you have my list with best tents for winter camping for 5 people or more, and for extreme conditions only, with very strong and stable frames and durable fabric. The term winter tents I use here by following the terminology described in my separate text. This means that here I present only the tents that are for extreme weather conditions and not suitable for all seasons. In view of the content of this site, these are only large tents for 5 people or more. The tents in the list below are given in alphabetical order, so this is not ranking of any kind. Here I give only a few basic data and features, so please follow the links for more details. This Arctic Oven is a true winter tent because of the following. This is a double-layer design where the inner tent is built from a breathable Vapex fabric which is used in this tent only. But it is also designed so that you can use a wood stove inside. The breathable fabric makes it suitable for more than just winter, but this is a cold weather tent. The frame is extraordinary strong, designed for the harshest arctic conditions. The area is 152 ft² (14.1 m²) but it also has a huge vestibule which adds 46 ft² (4.3 m²) of the protected space. The tent is also very tall with the peak height of 7’2” (218 cm). It is a waterproof and completely reliable freestanding tent. This Colle Sud tent is with the declared capacity of 6 people, its diameter is 150 inches (380 cm) and the peak height is 86.6 inches (220 cm), and the weight is 35 lb (16 kg). You have 7 aluminum 7001 T6 poles 13 mm in the diameter that intersect at many points, so the structure is stable to pressure from any side, and it is fully freestanding. They do not provide the official numbers for the area, but the base is more or less the shape of an octagon. So my estimate is that it is around 118 ft² (11 m²), which is enough for 6 users. 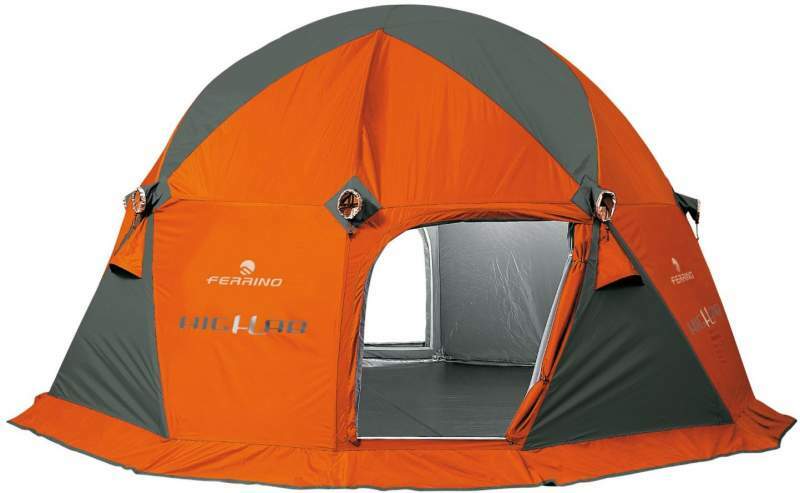 The tent is with a full coverage fly and the rating of 4000 mm. The inner tent is water-repellent, breathable nylon ripstop, while the floor is an aluminized polyester oxford with 4000 mm rating. The inner tent is with windows that have mesh and zippered panels. As of the moment of writing this text, this tent is not available on the US market, but you can find it on several Amazon stores in the EU. It is under the name Ferrino Glues South on the Amazon-UK, and you can find it also under the name Ferrino Colle Sud in some other Amazon stores. 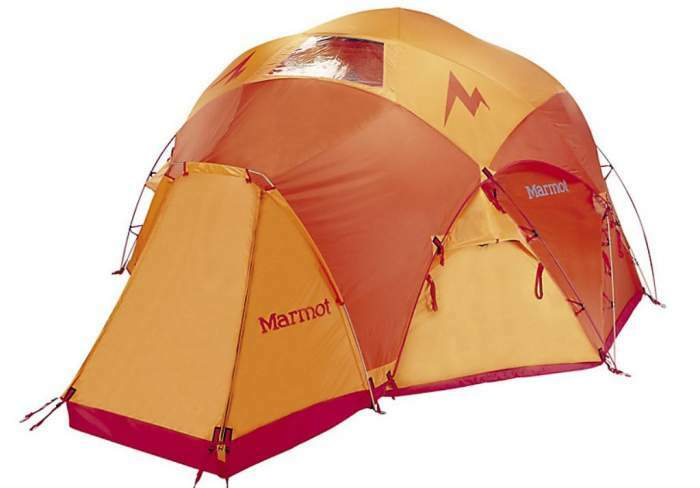 This Marmot Lair 8 is a semi-freestanding type because of the vestibule that must be staked to the ground. It comes with 10 excellent DAC aluminum poles that cross each other many times making the structure very strong. This is an exceptionally tall tent with a peaked height of 96 inches (244 cm). You have the inner tent without mesh sections plus the fly so the tent is quite enclosed and designed for cold weather only, maximum 2 seasons, winter and later autumn or early spring. 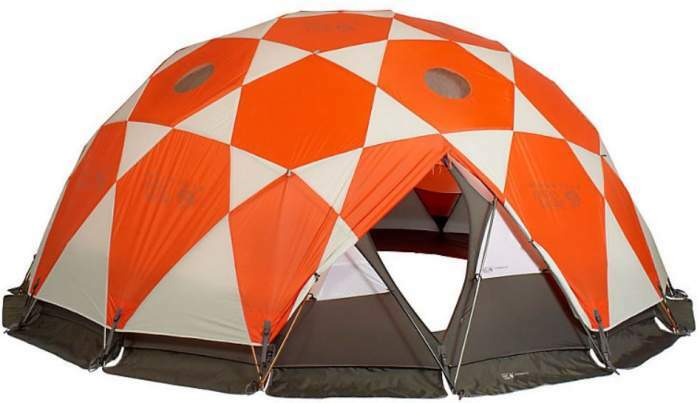 The tent is lightweight in spite of so many poles and such a fabric, it weighs 26 lb (11.8 kg). The waterproof rating is 1800 mm for the tent and 5000 mm for the floor. You have two doors and a roof vinyl window. Please follow the link for more details. Mountain Hardwear Stronghold 10 Person Tent. 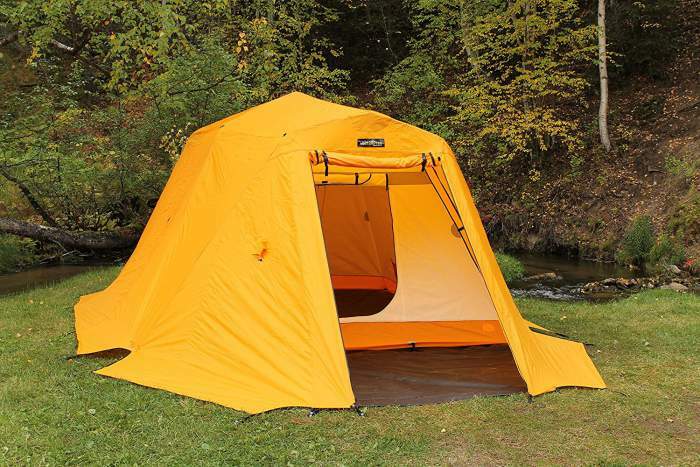 This Stronghold 10 is a fully freestanding and double layer dome structure. 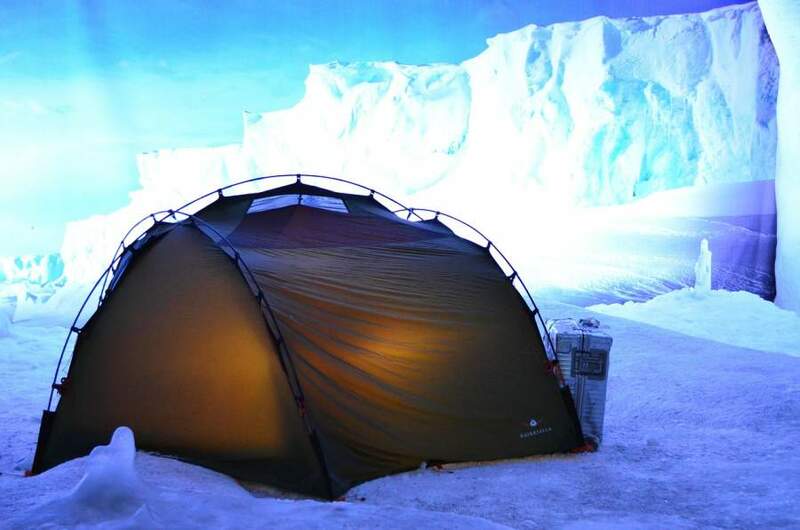 It is supported by 15 DAC poles, so it is designed for harshest winter conditions and expeditions. Note that this is a floorless design, with an optional floor that can be ordered separately. 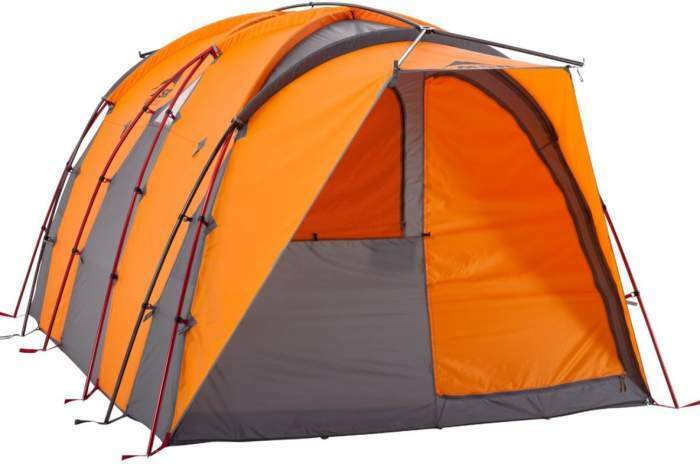 This is a tent with a stand-up height, the peak is 77 inches (196 cm). The declared capacity is 10 people and the area is 171 ft² (15.9 m²). This is a relatively heavy structure, not surprising in view if so many poles, it weighs 48 lb 12 oz (22.06 kg). The waterproof rating is 1500 mm, and for the optional floor it is 10000 mm. All in all, this is a true winter tent, suitable for a maximum of two cold seasons during the year. It is also rather expensive, so please follow the link to check for the price updates. The letters H.U.B in the name mean High-Altitude Utility Basecamp. So you realize immediately what the best use of this tent is, this is an expedition winter tent, one of the best that you can find, and also one of the most expensive tents on the market. The tent is tunnel-type, and surprisingly it is fully freestanding, this is something unusual for such a type. The tent is a single-layer type and the floor is completely removable. Also removable are the vertical front and back walls, this is because of a shed which you can buy separately and zip to the tent. The declared capacity is 8 people and the area is 108 ft² (10 m²), so it is best to downgrade the number of users to 5 maximum. There are 7 poles and they are incredibly strong, suitable for Himalayas, Antarctica, and similar environments. The tent is heavy, it weighs 49 lb (22.2 kg). The waterproof rating is 3000 mm for the tent and 10000 mm for the floor. 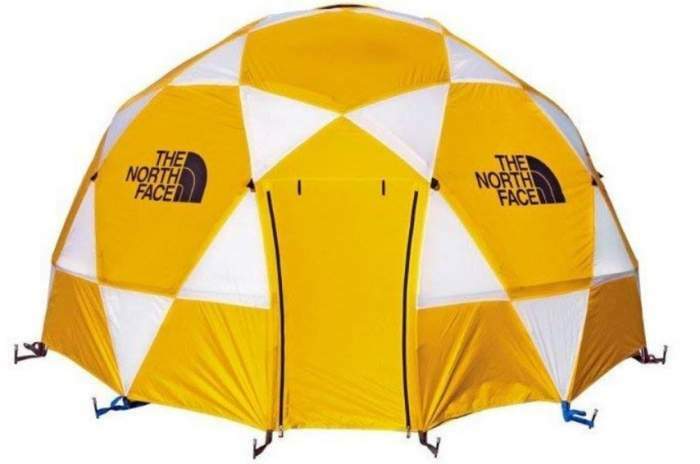 The North Face 2-Meter Dome – 8 Person Tent with fly. This tent is a hemisphere construction with 12 Easton 7075-E9 aluminum poles with 11 mm diameter, designed for the harshest winter conditions, a fully freestanding tent with a full cover fly. The height is 83 inches (211 cm) and this is more or less the radius of the hemisphere which you have here. The floor area is 125 ft² (11.6 m²) and the declared capacity is 8 people. The tent weighs 51 lb (23.1 kg) and its packed size is 32 x 23 inches (81 x 58 cm). The canopy and the fly are both 210D nylon oxford with 1500 mm PU coating, so you have two waterproof layers. The floor is a heavy-duty 420D nylon taffeta with a 10000 mm PU coating. So it is unlikely that you will find a more reliable tent for extreme weather conditions, but it comes at a price, please follow the link to see more. So this was my list with the best tents for winter camping that are currently on the market. All of them are very expensive items, but there are big differences in the price, the range is roughly $1900 – 5000. So it makes sense to check in detail, therefore please follow the links above. The weight is in the range 11 – 35 kg, so again check what suits you best. Only the Arctic Oven comes with the pipe jack so you can use a wood burning stove in the tent. From this you realize that this tent is very suitable for lower altitudes where you have wood to burn, it is also considerably heavier than the other tents. There are a few of them with a removable floor or without the floor. So if you want to have a completely sealed structure and to be safe from groundwater, better check those that have such a floor. Note that this is a temporary list, it will be updated whenever I find a great winter camping tent, so bookmark this text and visit from time to time. This is a list with tents for extreme conditions only. If you need some more options please check my list with the tents for cold weather camping, there are far more tents there and the prices are also very different. Thank you for reading, please let me know if I have missed a great tent, I shall be happy to add it to the list here. There is a comment box below, so please use it.